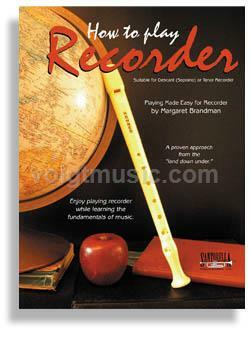 How to Play Recorder (Playing Made Easy) published by Santorella Publications illustrates Margaret Brandman’s “Playing Made Easy” teaching concepts, connecting the visual, aural and tactile recognition of music notation, while incorporating Catherine Weaver’s technical expertise & melodic phrasing concepts. How to Play Recorder teachesthe interval approach used to simplify reading, enhance aural awareness of musical sounds and foster the knowledge of the instruments in order to accelerate music learning and make playing “easy”. The accelerated learning techniques in this Santorella Publication include the use of color and a faster understanding of rhythm, pitch, keys and chords. This Australian best seller, revised for the U.S. Market by Michael Ruta, is quite an asset to our very successful and educational “How To” series. Perfectly suitable for Descant, Soprano or Tenor Recorder, this proven approach from the “land down under” is the preferred choice of educators around the globe. About Margaret Brandman: Margaret’s career spans over 25 years starting at an early age studying several instruments including piano, clarinet and recorder, graduating from the Conservatorium of Music in Sydney, Australia, and gaining her Bachelor of Music degree at the University of Sydney. During this time she has refined her “Playing Made Easy” music education method. Her works include pieces for instrumental combinations and piano, a complete range of education materials including the Contemporary Aural Course, the Contemporary Theory Workshop Series, the Contemporary Piano Method and a video demonstrating her unique teaching method. Margaret has over 30 instructional books of her method published, selling in Australia, England, Europe and North America. Much of her time is spent lecturing, holding workshops throughout Australia and writing articles for numerous musical publications. About Catherine Weaver: Catherine is a concert soloist and ensemble player specializing in the performances of Baroque repertoire for the recorder. She has a Bachelor of Music degree in performance from the Sydney Conservatorium & Education Diploma in Primary School teaching. Catherine’s teaching methods include a particular emphasis on rhythmic & aural development as well as melodic phrasing. Her teaching experience includes primary & infants class teaching as well as teaching individuals & groups of all ages and abilities.